WSM has applied an innovative coating technology that sets new standards in environmental protection and quality since 2009. The use of dry ice for the pre-cleaning eliminates manufacturing-related contamination in an environmentally friendly manner and without toxic waste. The subsequent priming and wet coating with a high-solid industrial coating is low in emissions and achieves C3 m quality as the standard with regard to abrasion and corrosion resistance. But what happens exactly?First, the welded steel structures are protected, where necessary, with zinc spray that is applied to sensitive areas such as welds. This enables temporary storage even in the open air without causing corrosion damage. When the capacity-related storage period is over the metal parts to be painted enter the paint shop. There, pre-treatment takes place first. Already here, the first innovation comes into play. Usually, metal parts are washed with a highly concentrated solvent prior to painting in order to remove scale and grease residues that could affect the subsequent application of the paint. At WSM, we take a different path: “After intensive tests with organic materials and steam jets, we opted for a dry ice process,” explains production manager Hartmut Meyer. In doing so, -76°C ice particles are sprayed under high pressure onto the metal to be cleaned. Adhering impurities become brittle immediately and are removed by the pressure. “All that remains is the dirt on the wall of our hall, which of course has to be removed on a regular basis, but there is no contaminated water, no contaminated atmosphere and no contaminated staff,” explains Meyer. The employee handling the spray lance only needs hearing protection. The dry ice is a recycled product in the chemical industry and is not produced separately. A new dry ice box is needed every two days. The paint shop is a complex plant. Here, the outside air is sucked in, preheated by a gas surface burner and then blown into the hall at a precisely measured flow rate. In order for the metal and paint to always react optimally with one another, the temperature and humidity in the hall must be exactly right. The same applies to the temperature of the workpiece which is measured quickly with an infrared gun. All important parameters are documented and retraceable over years. Propellers on the hall ceiling push the warm air downwards, creating an air loop that keeps the construction parts set up on the hall floor dry. Three large-scale extraction systems transport the hall air outside again. 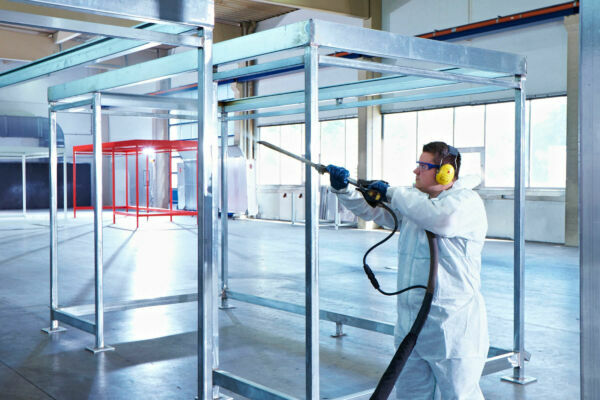 “If one places the workpieces to be painted in front of the extraction systems this results in a very concentrated flow of spray mist from the paint gun,” says Meyer. The painting is carried out in two stages: First, a two-workpiece polyurethane primer is applied, followed by a top coat also made of a two-workpiece polyurethane paint. WSM uses water-based high-solids paints to achieve C3 m industrial grade by default. High-solid stands for a high solids content of 75 percent and a correspondingly low solvent content. The advantage: high yield and low emissions of volatile organic compounds (VOC). An electrostatic process optimises the paint application even more. For this purpose, the sprayed-on paint is electrically negatively charged while the workpieces to be painted are electrically grounded and thus receive a positive charge. Paint particles and workpiece attract one another and a so-called adhesion wrap takes place: The spray mist from the gun spreads itself around the workpiece “automatically”. This means one can coat four sides with just two passes. The paint also distributes and adheres better in openings and in hard-to-reach areas. Simultaneously, overspray (in which the coating flies past the workpiece into the atmosphere) is avoided. The result: approx. 20% less waste. The large inlets of the extraction system are behind the workpiece. They “inhale” and remove the remaining paint-saturated air. This first flows through a filter pack in which particles are trapped and is then cleaned in several stages. “The end result is a degree of purification of about 98 percent, in other words almost pure exhaust air,” says Meyer. The extraction system detects the condition of the filter packages and automatically reports when replacement is required. Drying of the workpieces takes place adjacent to the painting area. Here, too, innovation is at work: instead of using hot air, we work with particularly powerful halogen spotlights. So-called radiation drying does not use the lamps´ heat, but the radiation emitted by them. The radiation spectrum used moves beyond the visible range of light and extends to the short-wave infrared range. This short-wave radiation is harmless to humans. The rays penetrate deeply into the material where they cause the paint molecules to vibrate and thus precipitate drying from the inside out. In this process, even very thick layers of paint harden completely. The workpiece itself is hardly heated, which ultimately saves energy through the shorter drying time. A reflector wall mounted opposite the light source reflects the radiation enabling uniform and complete drying. A result is achieved in one hour which would otherwise require five hours. After this hour, the top coat can be applied, and after another hour, the workpiece is ready for further processing in the assembly hall. The organic solvents contained in the high-solids paint are too valuable to dispose of as hazardous waste. Therefore a dedicated distillation unit retrieves them from the exhaust air of the paint shop and the paint-carrying lines and makes them reusable. This takes place overnight while the freshly painted workpieces dry and wait for their further processing in the assembly hall. WSM only needs about one working day from cleaning to completed coating. “The painted part is already touch-dry after two hours, the chemical curing takes place within several days,” explains Meyer, “safe further processing can be done the very next day”. You find the article exciting and would like to learn more about it? Simply fill out the form below and we will send your request directly to the appropriate department. Yes, I agree that my details from the contact form will be collected and processed to answer my request. Take advantage of our diverse contact opportunities - we are gladly at your service! For decades WSM has stood for competence and reliability in metal system construction. Certified and particularly durable products and timeless design are WSM hallmarks as a manufacturer of mobile room systems, shelter systems, bicycle parking systems and information systems. The future-oriented production and comprehensive services such as integrated complete planning, modern design, fast logistics and professional on-site installation underline quality awareness. The result is a complete solution with a very special claim – quality in metal.